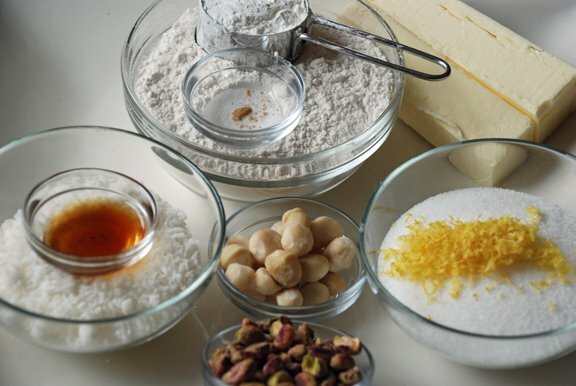 Coconut, butter, and nuts make up this delicious shortbread-like cookie. And they're so easy to make. Cream butter and sugar (and zest). I made half the batter with chopped macadamia nuts and half with pistachios (salmonella-free ones). After rolling the dough out in a gallon-size zipper-lock bag, I let it rest in the refrigerator for 2 hours. Then, after cutting them out, I put them back in the refrigerator to firm up a bit before baking. 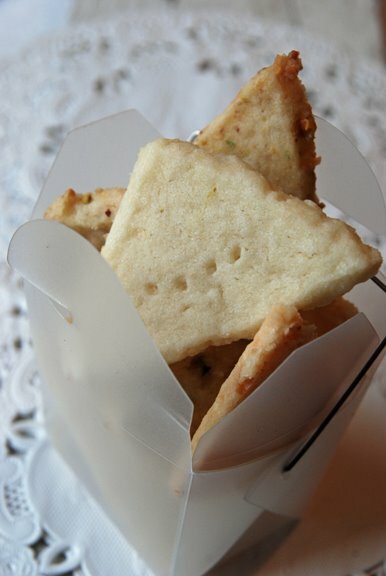 You can find the recipe for Coconut Butter Thins in the book Baking: From My Home to Yours by Dorie Greenspan or here. To see how the rest of the TWD group fared with this week's recipe, click here and then click on each blogger! Thanks to Jayne from Barefoot Kitchen Witch who chose the recipe for this week. 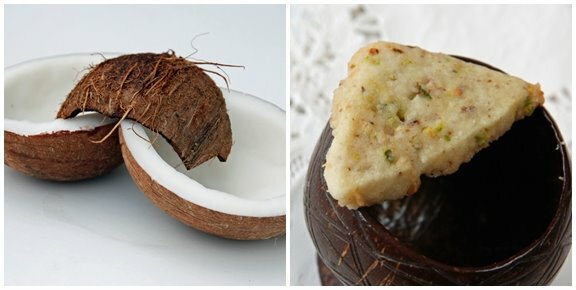 These cookies melt in your mouth at first and then you're left with a bit of a chew from the coconut and nuts. I couldn't decide which version I liked better. The pistachio cookies were slightly chewier, and I love their green flecks. Either way, we'll have crumbs left in the cookie jar. Banana Cream Pie on pages 342 and 343 chosen by Amy of Sing for Your Supper. Thanks to everyone who left a comment on last week's Tuesdays with Dorie post. Green Valley Pecan Company sent me two ½-pound bags of pecans cultivated near Tucson, Arizona. I'm giving away one of the bags they sent me, and Grace from A Southern Grace was the winner! Did you hear that pistachios are being recalled? These look fantastic!! I bet pistachios would be great!! I really liked these cookies, too, and am curious about making pistachio ones. Of course I'm craving pistachios now that they are recalled! Great photos as always! Way to go on making two different versions. Glad you enjoyed them. Beautiful photos! I bet both versions were delicious! A lovely photo as always. I finally got my post up. Did you like the pistachio choice? Beautiful cookies. The ingredients remind me of Hawaii. I like the triangles...and thanks for the tip about putting them back in to chill again before baking. Does that keep them from spreading? Beautiful execution. Your cookies look totally professional. Great photos!! I like the pistachio variation. I love how everybody's butter thins turned out differently. It's been fun to click on different blogs and see the same cookie in different shapes. Love the triangles! :) Your photos are always beautiful! I love the triangle shape. The pistachio ones must have been delicious. looks so good Shari! i love coconut cookies too. I love the green flecked ones too - they look awesome! Great-looking cookies! I love the triangle shapes, so pretty! What awesome looking cookies! I love that you used (salmonella free) pistachios in part. That sounds like such a great idea! I'm so sad about this salmonella pistachio thing, by the way. UGH. I'd love to try these with pistachios! They have the most wonderful color! Great post. I love the coconut! Your cookies look wonderful and tasty. I thought this recipe was very good and Im sure I will make them again! Wow, I love that you went the extra mile and used fresh coconut...I bet your cookies tasted sublime! I love pistachios! Great post once again. You site is so fresh and professional. Pistachios - now why didn't I think of that?! I love the green color they bring to baked goods. Looks like yours turned out beautifully. I think the pistachio ones would definitely be worth the effort. 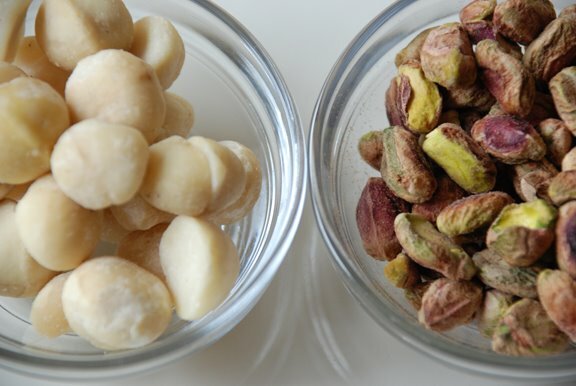 Oooh -- love these with pistachios! We thoroughly enjoyed these cookies as well. Yours look gorgeous! I love the little green flecks in the cookie. Hope your pistachios are some of the safe ones. Great job. They look yummy! ah, i do so prefer salmonella-less pistachios, and creamy macadamias make me weak in the knees. awesome, awesome cookies, and thanks again for the pecans!! Vibi - Unfortunately I just threw that pic of fresh coconut in because I liked it. I didn't use fresh coconut in this cookie, although I'm sure you could after drying it. No time to do that these days! Amy - The pistachios were the ones I grabbed first. Angela - I like the pistachio version the best. Audrey - Yes, I think chilling them again helps avoid spreading. Also, if the oven is too hot, cookies will spread. Linda - I have to admit that I didn't use fresh coconut...shhhh...don't tell anyone. Thanks to all who dropped by! Wow! What great ingredients! Love the pistachios. Your cookies look wonderful!!! Love the comparison of the two recipes! Always all about the research you know! Your photos are so inspiring. Mark loves pistachios, so I think he would like this a lot, and the little green flecks are really pretty.